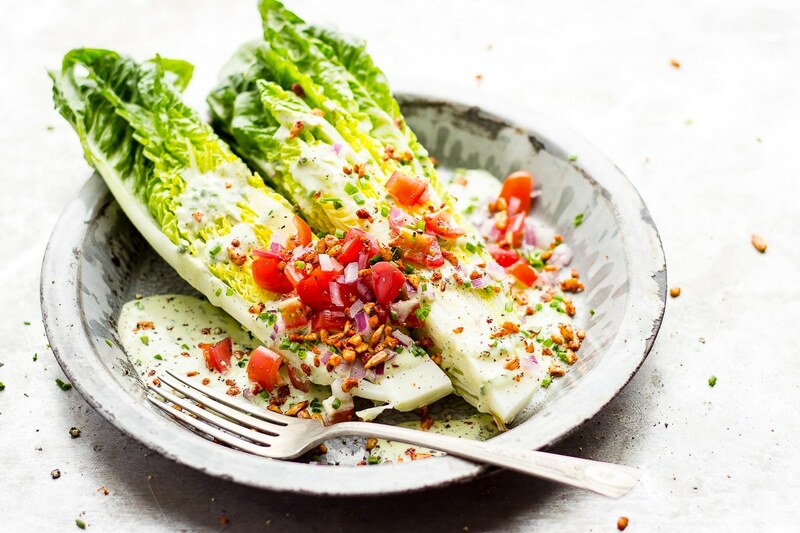 A vegan romaine wedge salad that is topped with raw, creamy chive dressing and smoky sunflower vegan bacon bits. Summery food at its finest. Vegan, romaine wedge salad with chive dressing. The wedge salad. A classic dish. A recipe that doesn’t necessarily need to be messed with or fussed over. And a favorite of mine for as long as I can remember. Crisp iceberg layers, creamy blue cheese dressing, sweet tomatoes and crispy, smoky bacon bits. I don’t eat them often, but when there’s a real good one on a menu I trust, I go for it. When I was back home visiting my folks in New York last weekend I couldn’t resist it. And as I was eating it, I was like this is so good. I love it so much. I want to eat this everyday. So I decided to create a vegan, romaine wedge salad. One I could eat everyday if I wanted to. But before we get into this vegan wedge salad, I want to tell you a story. Not too long ago I posted a recipe for a potato-less potato salad. It’s gotten rave reviews. And, it’s also gotten some major kickback. I get it though, potato salad is emotional. Generally, feedback has fallen into one of two groups. The ‘Oh That Sounds Interesting And I Really Want To Make That group’ or the ‘That’s Appalling And Offensive And Absurd’ group. Potato-less potato salad? As if I was trying to trick you into something. To the naysayers, my intention behind this recipe was to inspire you to think about your food in new and/or different ways. I was not trying to sell you something diet-y or healthy-ish or gimmicky. Because poached radishes are not potatoes. But to be fair, unless you’ve tried it you really can’t have an opinion about how it tastes, right? My intention was to continue the conversation about food. To get creative. To step outside of your comfort zone. To try something new. To look at vegetables differently, especially the ones you are not so fond of. To expand your palette and thought process. And to accept that radishes are not potatoes and sunflower seeds are not bacon bits and be okay that they’re still delicious and fulfilling in their own right. But! These smoky sunflower ‘bacon’ bits are amazing. And actually they’re kind of a game changer for me. You could sprinkle them on avocado toast and veggie sandwiches, or on top of omelettes or potato salads. They’re a versatile topping that lends well to just about anything. These bits, along with this salad is summery food at its finest. And a quick, oven-free, flavor-packed recipe that I’ll be repeating all season long. 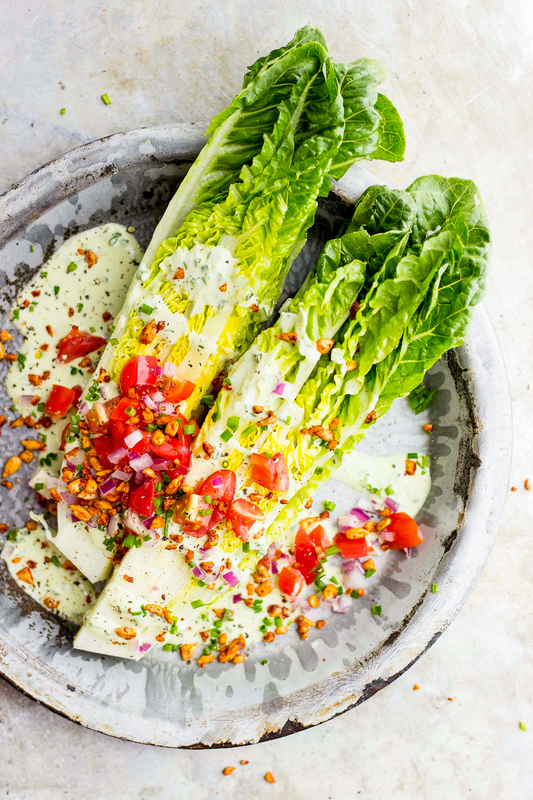 This romaine wedge salad is topped with a raw, vegan, creamy chive dressing powered by Silk. Thanks for supporting the brands that make it possible to bring you free, quality content each week. 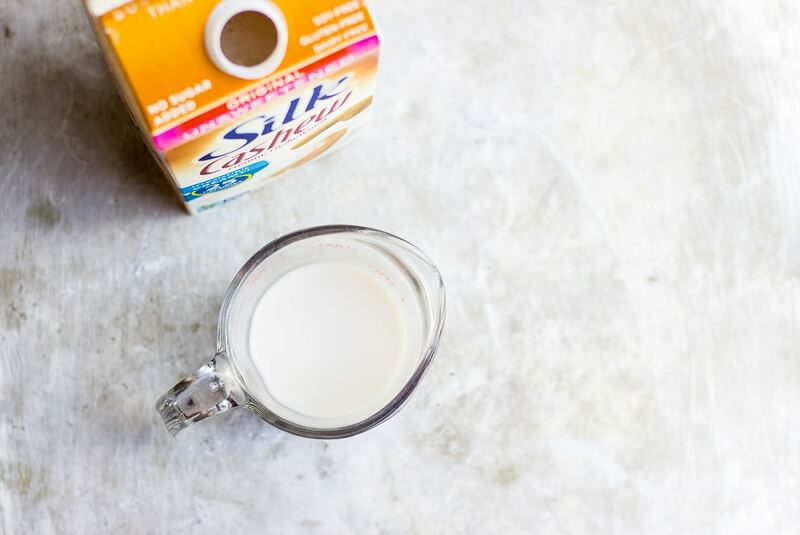 For updates, discounts, offers and more sign-up for Silk’s newsletter here. 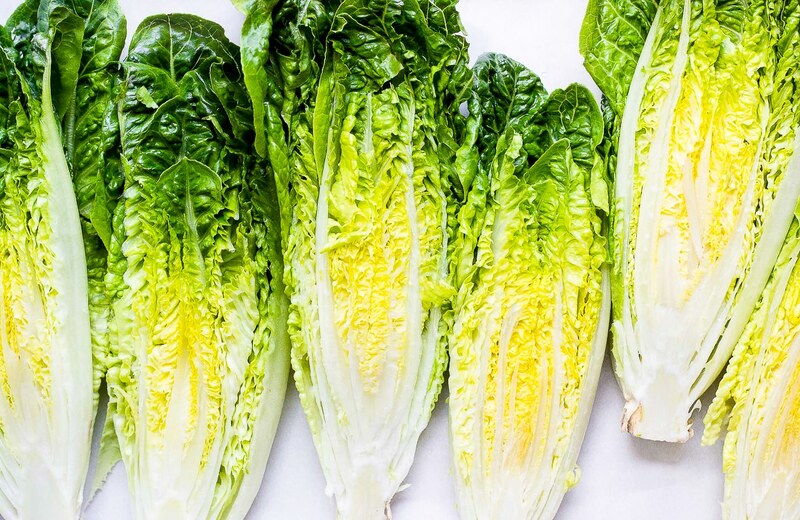 The romaine here would also be great grilled. This yields 2 cups of dressing, which is more than enough. It can be stored in the refrigerator in an air-tight container for up to 5 days. The dressing may thicken as it chills. Add in a bit more milk to reach your desired consistency and shake. Slice the lettuce in half and then quarter the romaine heads. Wash and dry and set aside. 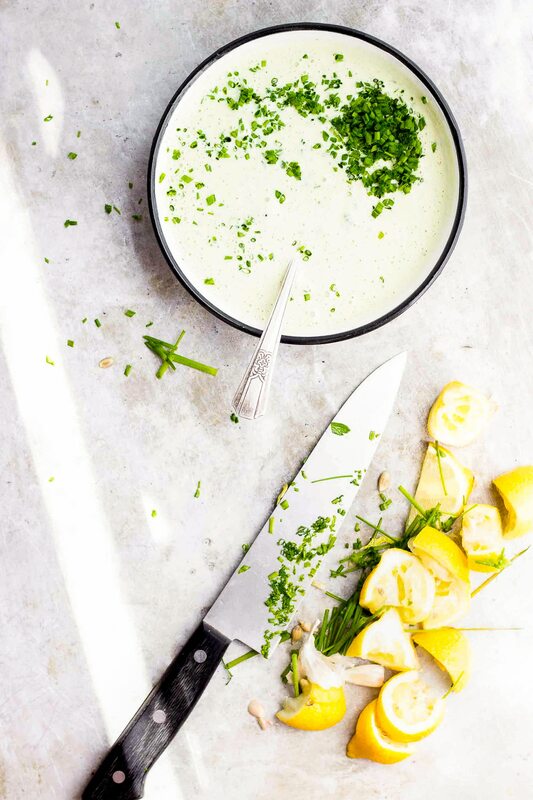 In a blender combine the cashews, milk, lemon juice, chives, parsley, garlic, salt and pepper. And blend until smooth. To assemble the salads, top each romaine section with chive dressing, tomatoes, red onions, Smoky Sunflower Bits, more chives and black pepper if desired. This recipe can be double as necessary. Refrigerate extra bits in an airtight container for up to 5 days. Pulse the sunflower seeds in a food processor or blender until roughly broken. This could also be done with a sharp knife. In a small mixing bowl combine the chopped seeds with the rest of the ingredients and mix until well-coated. This post is sponsored by Silk; all opinions are my own. « Peppered Balsamic Strawberries + scenes from late spring! You are absolutely GENIUS, Sherrie! I haven’t had a wedge salad in years. Between the nutrient-less iceberg lettuce, heavy dressing and bacon – I’ve avoided it. This is going to be on the table tomorrow night. I can’t wait! Myself and my family loved the potato-less potato salad. And in fact my husband has requested it for Father’s Day. Thank you for inspiring me! If there wasn’t people like you challenging me, and others, food wouldn’t be such an exciting part of life. Your creativity shines, and you’ve opened my eyes to many things like that rockin’ poached radish salad! And now these bits of savory goodness. And a salad that has my name all over it. xo! So pretty and so beautifully presented! Sherrie, keep doing what you do. No need to defend your creativity! There are traditionalist, those people stuck in their ways, who shut our everything new and different. It’s out of fear and the feeling of security they get with habit and routine. Then there are the innovators. The creative, unique individuals who approach things differently, making the ordinary extraordinary. Without them, how would we grow? This is you. You are a innovator. Challenging the norm and helping outers get out of their comfort zone. And how wonderful this is that you are doing this through delicious food!? Incredible, if you ask me! Whether it is potato-less potato salad or a vegan cobb, we need people like you keep the world of food fun, modern, and exciting! Sending you the best. I love the creative spin you take on classics. We had the potato-less potato salad recently, and yes it’s different but we really liked it! I’m a huge radish fan, but even my husband who isn’t so into radishes ate every bite, so… success! I’m looking forward to trying your take on the wedge salad. 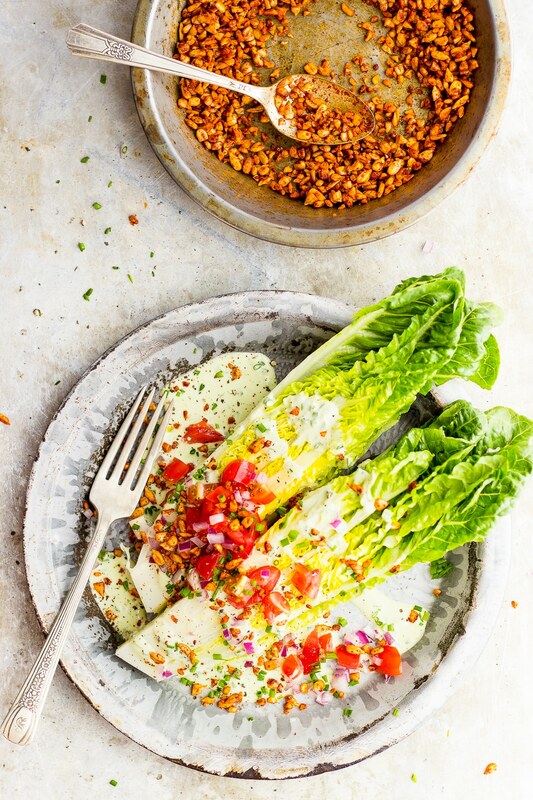 I’ve actually never had a wedge salad, but this looks so delightful and I can’t wait to try those smoky sunflower seed ‘bacon’ bits. I love the fact that you take your passion for food – which is an essential part of our life, and make it not only with healthy choices but fun and I look forward to every recipe. I too love wedge salads and bam you spun it around and made it into a tasty fun healthy recipe. You are amazing and talented. I’m your biggest fan. Love you, Mom. This salad looks great and those ‘bacon’ bits are just genius! This is probably the best wedge salad I have ever seen. Not like the typical very boring ones, but SO jazzed up and full of life! I also get the “if it’s VEGAN then it ISN’T a burger/cheese/anything” feedback sometimes. But, I completely appreciate your potato-less potato salad. Food rules are meant to be broken if you ask me, and we should have creative license to name it anything we please. Do the cashews need to be soaked for the dressing? Hi Kayla – they don’t need to be soaked, but if you’d like to you can do so for 2 – 4 hours.